Through the courtesy of the Four Winds race organization and the Chicago Area Adventure Racing Association, I found myself with an entry to one of the USA�s premier adventure races. All I needed was to find three other teammates, coordinate flights, transportation, gear shipment, hotel, find a crew, buy tons of new gear (that's the fun part), and prepare myself for the race. Although I had planned my team�s participation in many races in the past four years, none would be close to this one. The team was finalized only days before the race and included Tom Solie, Danny Bobrow, Colleen Kristofor, and myself. 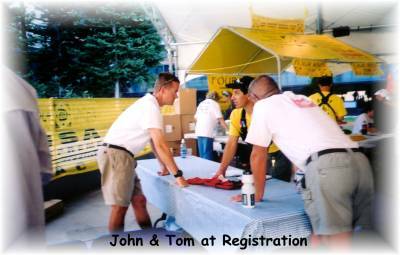 Tom was the first to respond in our search for teammates from the Chicago Area Adventure Racing Association. He was new to the sport, having done his first race in June. Everyone told me to not try a race of this length with someone who has little race experience, but I had a good feeling that Tom would be a great teammate and I liked his enthusiasm for the sport. Danny was a veteran of mountaineering expeditions to some of the highest peaks in the world and an Ironman triathlon finisher, but he also brought limited adventure racing experience. Colleen was a true newcomer to the sport with no race experience, purchasing her gear just days before the race, and having no opportunity to train with it. She would even be renting a bicycle in Salt Lake City. I brought the most race experience, with over 15 races over the past four years, but still no experience in a race longer than two days. In my four years of adventure racing I�ve been preparing myself for an expedition-style race. I just hadn�t expected it to come together like this. We were heading to Salt Lake City for an eight-day race. We wouldn't even meet Colleen until we got to the airport. Friends and family are questioning my sanity, but my past experience has taught me that personal goals and compatibility were significantly more important than time on the course and I had good feelings that we had put together a solid group. 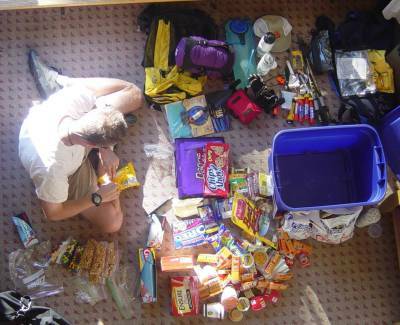 We arrive at the mandatory gear check area and are instantly told by �Gear Master Jerry� that we have too much stuff. We�re all too aware of that fact, but it�s all on the required gear list. Three grueling hours later we�re through the equipment and skills check. Now, how are we going to haul all of this stuff?